Speaking with reporters before departing on a trip to Europe, Trump was asked to confirm a South Korean news report that US Secretary of State Mike Pompeo took with him to Pyongyang a CD of Elton John's song "Rocket Man" to give to Kim last week. 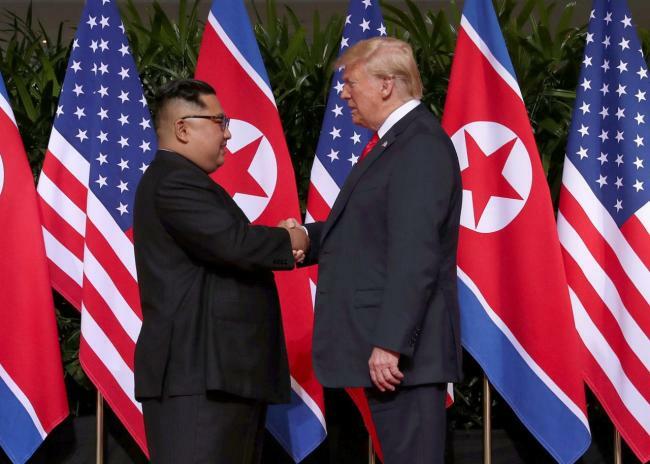 "Rocket Man" is a nickname Trump used to mock Kim last year when the two traded insults over North Korea's testing of nuclear weapons and ballistic missiles targeted at the US. "They didn't give it. I have it for him," Trump said. "But it will be given at a certain period. I actually do have a little gift for him, but you'll find out what that gift is when I give it." Pompeo traveled to Pyongyang last weekend to flesh out the details of an agreement reached by Trump and Kim at their historic Singapore summit last month. Kim committed in the meeting to the "complete denuclearization" of the Korean Peninsula in exchange for security guarantees from the US. Pompeo said after his trip that there had been progress in the talks. But he also acknowledged that a lot of work remained to be done, including on the issue of setting a timeline for denuclearization. On Monday Trump reiterated his confidence in Kim.